Agua Caliente Hotel Lattice Commercial shade structure by Atlas Awning in Rancho Mirage. We have been serving the Coachella Valley in the same location since 1972. Our Commercial Covers Rock! Check out this one from the Agua Caliente Hotel in Rancho Mirage. We can design and build any commercial shade structure. We are the Palm Springs area's best and most dependable awning contractor. Call 760-327-8466 today. Atlas Awning knows how your apatment building can benefit from a commercial shade cover. Let us bid on your next shade requirement. This is actually a large upscale condominimum project we were a subcontractor for this installation. Atlas Awning designed and installed this commercial shade cover at Eisenhower Medical Center. We are know for providing seamless service to our customers. Want worry free service? Call us today, 760-327-8466. Custom commercial patio covers are our specialty. 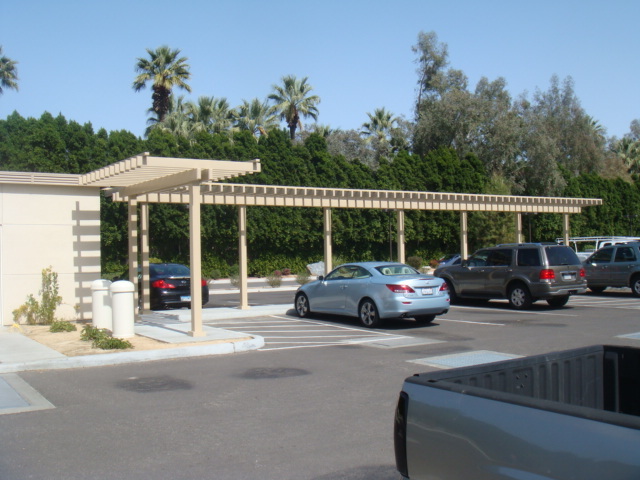 In this photo we exhibit state of the art design with a beautiful, architecturally perfect, parking area shade structure.